Corona, Sloop, 4 tons. Mr. G. W. Hind. Was born in 1863 at Beverley, Yorks, and educated at Great Driffield. 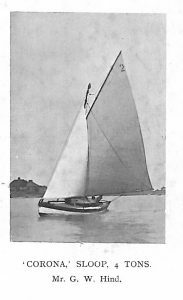 He commenced yachting in 188o, and was first part owner in the canoe yawl Mischief. He subsequently owned the Gertie, 3 tons, Violet, canoe yawl, and Ivy. He now owns the 4-ton canoe yacht Corona. He commenced racing in 1899 with the Gertie, and won a number of prizes. He raced the Corona during the seasons of 1902 – ­1906, and won fifteen firsts, twelve seconds, and nine third prizes for forty-eight starts on the open sea, Humber Estuary, and at up­river regattas. Clubs: Humber Yawl, Humber Sailing. Address: 4, Blundell Street, Grimsby.